This is the second book I have read and reviewed for this author. The first was Blind Sight and my review can be read here. Earth is a mess and the ruling corporation is trying to get people into space to colonize other planets. Living under corporate rule is horrendous--if you don't agree--you disappear never to be heard from again. Profits are the name of the new game and the larger corporations are always trying to get on top so they can call the shots. What they don't know is that a couple of their spaceships have made it. They all crash landed but some of the people survived. In one of those ships there were a bunch of black labs who thankfully did get let out of their cages and were able to survive. Because of the difference in the atmospheres these dogs became highly intelligent! They befriended those who were good and stayed away from those who were not. There was already a colony of humans who were living happily when the 3rd spaceship crash landed. Unfortunately not all these people were good and one of them became a dictator making the survivors of that ship miserable. A lot of what you will read in this book is already happening but I don't want to ruin it for you. It is also the first in a series and the author left me hanging--------I want to know what happens next!! 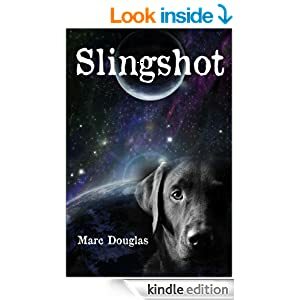 Slingshot is an adventure set in the future. Issues today (environment damage, shrinking resources, inept politicians, bizarre dictators, religious fanatics and economic chaos) are projected into an era when Earth will no longer support our bludgeoning population. A sister planet is found, a method to travel is discovered (the Slngshot Principle) and two of our first long range missions crash and are marooned on an alien planet. Not quite the start they envisioned but a clean slate and new beginning regardless. A story of courage, passion, faith and fortitude. Marc lives in North Carolina with his wife and dog (Zen Master), Charlie. “Blind Sight” is his second thriller. He has just released a novel inspired by Dumas (Count of Monte Cristo) titled “A Matter of Vengeance.” A fourth book has just been published for the “Slingshot” series and a fifth book is in the works. A book about his stroke and how different issues were dealt with will be for sale shortly. I received a pdf copy of this book for review purposes. All opinions expressed are my own honest opinions. For more information please check my Disclosure Statement. Our giveaways are in no way sponsored or promoted by Facebook. Almost sound like the world now but based in the future. I've never really read these kind of books. I'm more of a romance junkie. Futuristic adventure stories, arguably, are the best kind! I am interested to learn more about this Slingshot Principle! I love stories that include animals. I never read many books in the future, but with an animal in it... I could be persuaded. Yay for the dogs!! Sounds like a good mix of a story. I'm not usually pulled into futuristic reads, this one however had GRABBED my attention!!! So cool that there is a book about dogs! Sounds awesome! another great book to add to my list. Thank you for always sharing. Dogs as main characters interacting with people sounds intriguing! I have a black lab and I had to smile thinking of her becoming super intelligent. When I saw the cover, I wondered if it truly had dogs in it. That's a sci-fi concept I haven't read about before! This sounds like a very interesting read. I always love books like this because even if they aren't perfect, they provoke thought. I love the Lab on the cover, too! We have a Chocolate Lab cross, so it was the first thing I noticed. Now this sounds interesting. I want to read more about the dogs lol. I always like to read about dogs doing extraordinary things, and set in the future, that would be so cool! Oh sci-fi books! Sounds soooo interesting and one my husband would really love! Great review! This really is a very good story. I'm more than halfway through.